Swinton Folk Club: 7th November 2016 at Swinton Folk Club: GARY AND VERA ASPEY! 7th November 2016 at Swinton Folk Club: GARY AND VERA ASPEY! Gary and Vera Aspey became full time professional artists in April 1974. Their experience and performance content has, over the years, taken them to many varied venues including Folk Clubs, Arts Centres, Theatres, PTA & Sports Clubs, Round Table & Masonic evenings, TV & Radio, around the world including Australia, New Zealand, Hong Kong, Brunei, Oman, the Falkland & Ascension Islands, Belize, Cyprus, Sardinia and several European Countries. 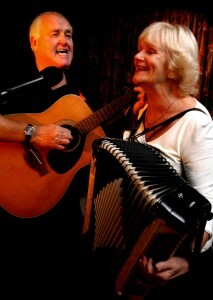 Gary and Vera are old friends of Swinton Folk Club and have played here many times before. Be sure to join us for an evening of fun and laughter!